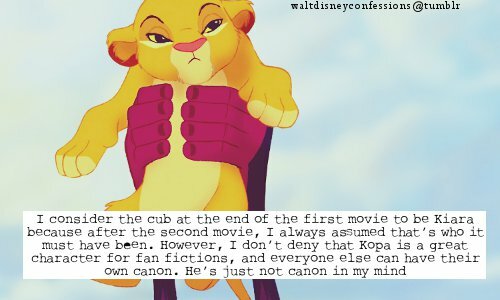 TLK 2 confesions. . Wallpaper and background images in the The Lion King 2:Simba's Pride club tagged: the lion king 2 simbas pride confesions. ^^ Yes it is Kiara. That cub is called "Fluffy" who dosn't have a gender. when TLK 2 was released, Fluffy finally gets a gender and a name, a girl Kiara. So Kopa is NOT Fluffy and never will be. Kiara is 100% Fluffy while Kopa is just fanfic by outsiders and not Disney's creation. He's not an official TLK character to begin with. Just from the books that was created by a outsider, Alex Simmons, who never worked with Disney. Kiara has no brother and she's the only child of Simba and Nala. Those books were only released in USA and have a stamp placed on them. It's not worth arguing about some books that aren't official and not cannon.